Delta Faucet and Goodyear Tire want to give you a better shower and a smoother car ride here on Earth by experimenting with their products in space. Goodyear and Delta Faucet are among a small but growing list of corporations that are investing in spaceborne research, where the microgravity environment offers researchers a unique opportunity to conduct boundary-pushing experiments. The companies announced last week they will send experiments to the International Space Station later this year, which makes them some of the latest commercial firms to take advantage of the orbiting laboratory and hefty financial assistance that NASA is currently offering. Once on board, astronauts on the space station will carry out the research, which is aimed at creating better eco-friendly shower heads for Delta Faucet and more fuel-efficient tires for Goodyear. What will Delta Faucet do? A common complaint about eco-friendly low-flow shower heads is that they don't offer a great shower. The water pressure can feel too low, and it seems like it takes forever to get rinsed off. Indiana-based Delta Faucet has developed shower heads that use a special "oscillating chip" to break up the water into bigger droplets and fling it out faster. The company says it creates the feeling of more water with less. 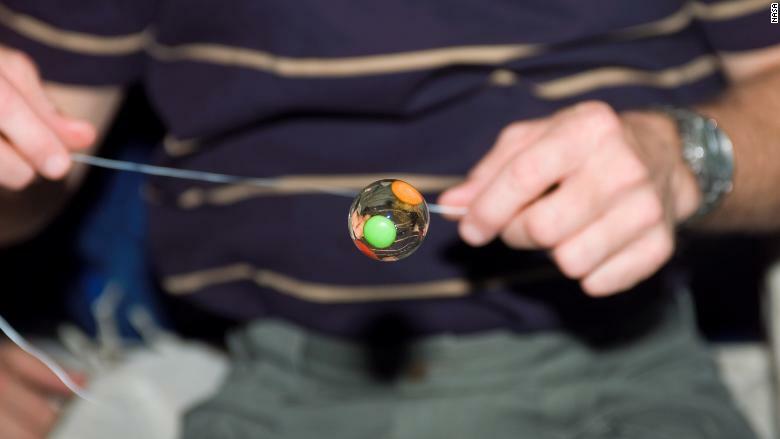 A water bubble with candy trapped inside floated freely on the middeck of Space Shuttle Endeavour during a 2008 expedition. 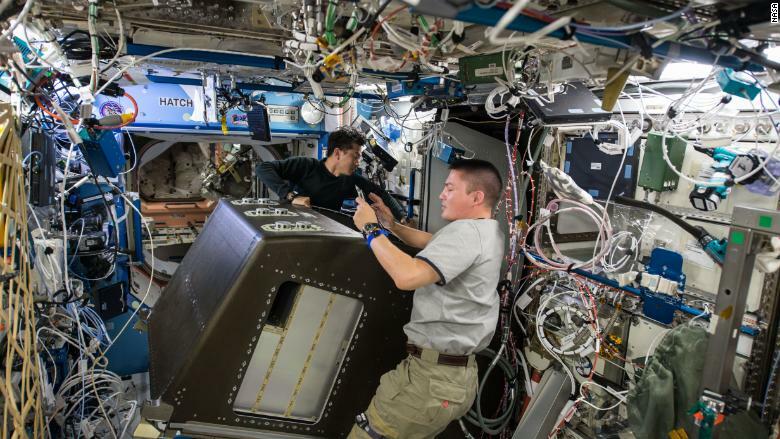 On the space station, where water forms into floating blobs rather than cascading to the ground, Delta Faucet will look to better understand how water flows through the chip. That may help the company make shower heads that use water even more efficiently. "We don't know what the boundaries are. The breakup of water droplets through a standard orifice, just going through a little hole, is fairly well understood," said principal product engineer Garry Marty. "We really don't know how that works on a fluidic chip." Goodyear will study how a compound called silica forms in the microgravity environment of space. "Silica is an important ingredient in pretty much everybody's passenger tire," said Derek Shuttleworth, a program manager at Goodyear. And it's one of the key components responsible for creating an easier glide over the road, thereby reducing what engineers refer to as "rolling resistance," Shuttleworth said. Silica can form into a variety of different structures even here on Earth. Goodyear wants to find out if new versions of silica, which may be able to offer even better rolling resistance, can be formed in the microgravity. 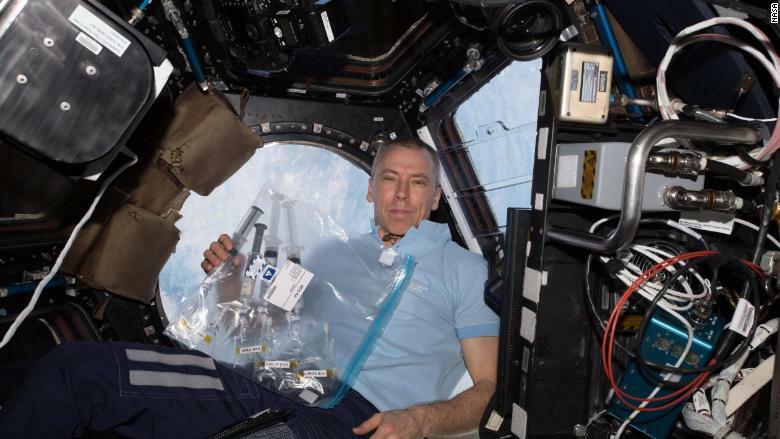 Astronaut Andrew Feustel worked on a student-led experiment that involved growing crystals in April this year. NASA has long known the benefits of doing research in space. In the microgravity environment, physical and biological phenomena aren't bogged down by the Earth's pull. So, doing the same experiment on the station that's been done on the ground can give scientists a better fundamental understanding of how something works. The ISS, which is considered the single most expensive object ever built, is essentially a giant laboratory that has hosted experiments for space agencies for about two decades. Seven years ago, NASA partnered with a group called CASIS to corral academics, researchers and others in the private sector to send third-party experiments to the ISS National Lab. Astronaut Ricky Arnold worked on a rodent research experiment last month. The partnership meant researchers were given a clear pathway to get their studies on board the station, and they'd be able to keep the intellectual property rights for themselves. "We were created so that the benefit could go to the organization doing the research," Cynthia Bouthot, the director of commercial innovation at CASIS, said. NASA also offers some huge perks to commercial researchers. The space agency takes care of the cost of getting experiments to and from the International Space Station, since they hitch a ride with other payloads. Astronauts, who are paid with taxpayer dollars, also conduct the experiments free of charge to third parties. All told, NASA estimates it takes care of about $7.5 million worth of logistical costs that researchers never have to touch. Researchers only have to pay for the cost of developing the actual experiment and ensuring its space ready. But even then, CASIS, which is funded by NASA, and other research groups can offer grants to help cover the remaining costs. CASIS spokesman Patrick O'Neill said that companies have recently been more willing to bear bigger chucks of the cost. That's a sign "microgravity research is bringing a solid return on the investment," O'Neill said. Of the 270 payloads that CASIS has so far helped send to the ISS, 176 have been for commercial companies. This year, 50 out of 69 payloads have been commercial. 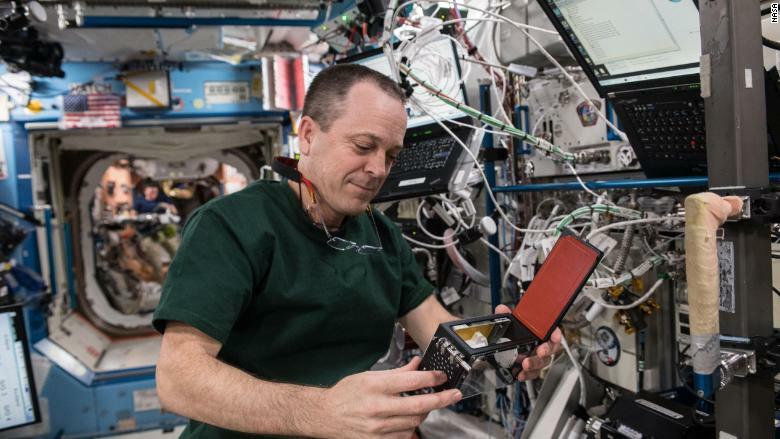 Japanese astronaut Kimiya Yui, left, and NASA's Kjell Lindgren worked to make room for new communications hardware that will be used for the commercial crew program currently in development. Life sciences have long been a major focus for research on the station. Merck, Eli Lilly & Company and Novartis have each sent multiple research payloads to the station. But an increasingly eclectic group of companies — including Budweiser and HPE — have signed on recently for spaceborne research. "Beginning last year, we started to see a real interest in utilizing ISS from private industry," Sam Scimemi, NASA's ISS director, told SpaceNews last month. 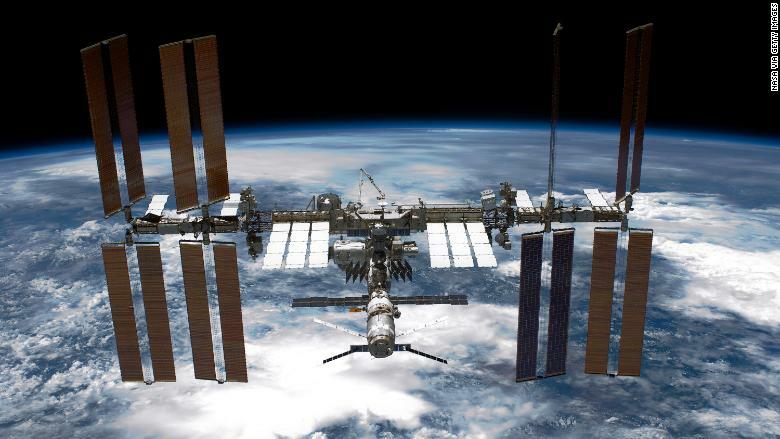 Commercial interest in the space station is good news for the space agency, which has made a significant push recently to hand over more ISS operations to the private sector so NASA can focus on deep space exploration.